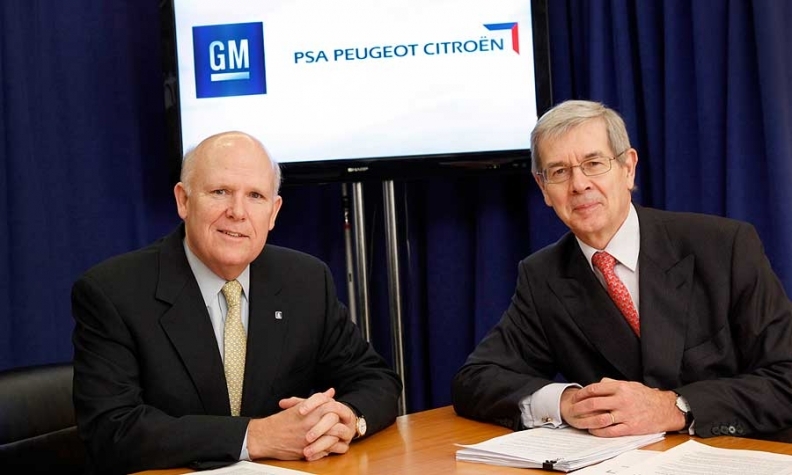 GM CEO Dan Akerson (left) with PSA CEO Philippe Varin pictured today in New York. DETROIT/PARIS -- PSA/Peugeot-Citroen has agreed to form an alliance with General Motors targeting $2 billion in annual savings within five years. "This partnership brings tremendous opportunity for our two companies," GM CEO Dan Akerson said in a statement. "The alliance synergies, in addition to our independent plans, position GM for long-term sustainable profitability in Europe." Added PSA CEO Philippe Varin: "This partnership is rich in its development potential. ... The whole group is mobilized to reap the full benefit of this agreement." GM will take a 7 percent Peugeot stake as part of a share issue by the French automaker, and the two companies will pool research and development, vehicle platforms and technologies. The agreement was announced after European markets closed. GM said it expects to spend $400 million to $470 million for the 7-percent stake in Peugeot. The final investment will be determined by market conditions when terms of the rights offering are set. The creation of a global purchasing joint venture for the sourcing of commodities, components and other goods and services from suppliers with combined annual purchasing volumes of approximately $125 billion. "Each company will continue to market and sell its vehicles independently and on a competitive basis," the statement said. GM and PSA said the alliance will initially focus on small and mid-sized vehicles, minivans and crossovers. The automakers may also develop a new common platform for low emission vehicles, with the first model expected to launch by 2016. GM officials told analysts today the deal is expected to close and take effect by the second half of 2012. The deal, which comes as both PSA and GM's Opel unit grapple with slow sales and overcapacity in Europe, has met with widespread skepticism among analysts and investors. "This is not the type of solution we need to see in the European mass market, where capacity has to leave," Credit Suisse analyst Erich Hauser told investors in a note. The alliance with Peugeot is the first deal GM has reached with an automaker since its 2009 bankruptcy. GM has undertaken European partnerships in the past but with mixed results. In 2005, GM doled out $2 billion to Fiat to end a failed alliance after five years. PSA has been more successful with targeted alliances across Europe, including joint ventures to build commercial vans with Fiat and engines with BMW Group. A top PSA official said it would consult with engine partners BMW and Ford Motor Co. about any new alliances with GM or any other automakers. "If there's any agreement that goes beyond our existing partnerships, each of those partnerships will have to evaluate what can be done," PSA industrial director Guillaume Faury told reporters at a briefing on Tuesday. PSA makes diesel powertrains with Ford. The U.S. automaker today had no immediate concerns about the potential linkup between PSA and GM. "Ford and PSA have a successful, long-term diesel engine cooperation," a statement from Ford said. "PSA has a history of working with other automakers, and that has never compromised their relationship with us. "We have built about 16.5 million diesel engines together over the past decade. With the potential to build up to three million engines a year, Ford and PSA are at the forefront of high efficiency, low CO2 diesel engine technology." BMW declined to comment on the partnership. Like PSA, Opel is struggling to reverse mounting European losses compounded by the region's auto sales slump and cut-throat price competition. GM's European operations lost $747 million last year, while PSA's core auto division was 497 million euros ($664 million) in the red in the second half. French markets regulator AMF yesterday called on PSA to issue a statement quickly to confirm or deny reports about the GM tie-up and capital hike but the automaker has yet to do so. PSA last week confirmed that alliance talks were underway, without identifying the potential partner. The Peugeot family, which owns just over 30 percent of the car maker, has signaled that it would not be opposed to some dilution providing it remained the principal shareholder. Reuters and David Phillips and Douglas A. Bolduc contributed to this report.